Cold winter nights call for hot soup. 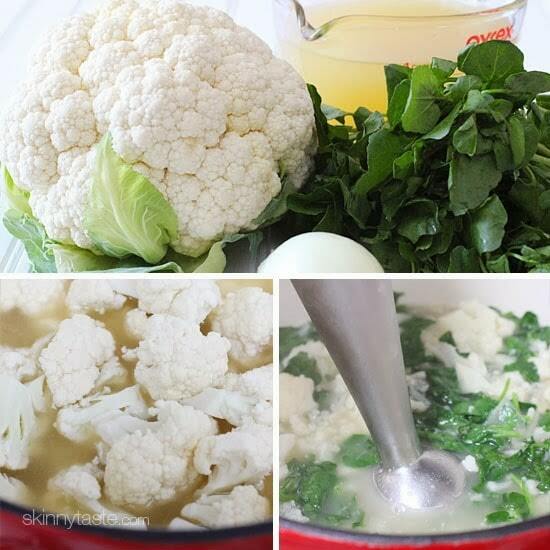 This cauliflower watercress soup is healthy and light, with a perfect creamy texture from the cauliflower. Great served with a crispy whole grain piece of bread and a drizzle of olive oil on top, yet it’s light enough to serve with a sandwich or a first course. We were hit with a snow storm yesterday, and we’re expecting another tonight. After shoveling myself out of my parking spot and coming in from the cold last night, this soup hit the spot. A few of my other favorite creamy winter soups are Cream of Asparagus Soup, Creamy Carrot Ginger Soup, and Instant Pot Tomato Basil Soup. This recipe was inspired from someone who tweeted me the idea to add watercress to my Dad’s cauliflower soup. 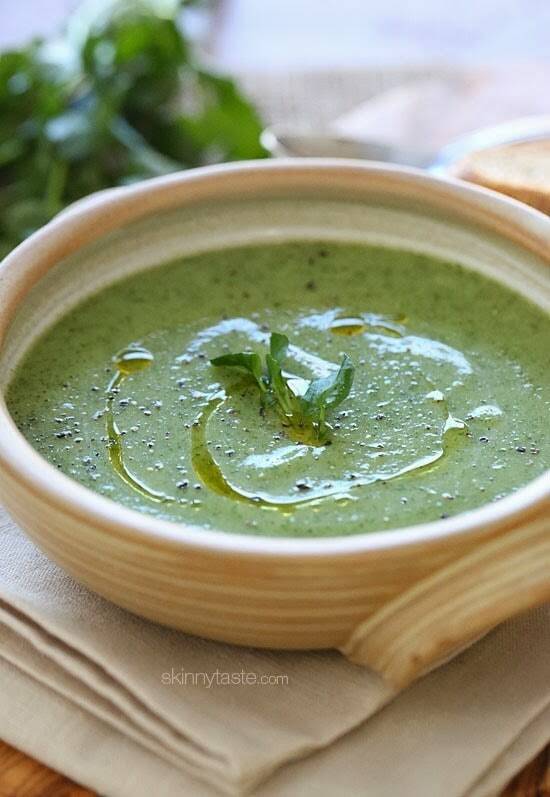 Such a great way to incorporate watercress into soup which is considered a superfood. It’s rich in fiber, anti-oxidants, vitamin C, beta-carotene, folate, potassium, calcium, phosphorous and iron and adds a bright green color to this soup. Cold winter nights call for hot soup. This cauliflower watercress soup is healthy and light, with a creamy texture from the cauliflower that’s perfect served with a crispy whole grain piece of bread and a drizzle of olive oil on top, yet it’s light enough to serve with a sandwich or a first course. In a medium nonstick saucepan, melt the butter over low heat. Add the onions and saute until soft, about 3 minutes. Add the flour and stir about 1 to 2 minutes. Add the chicken broth and cauliflower and increase heat to medium-high. Add the watercress until wilted, about 1 minute and puree with an immersion blender until smooth. I made this with a bag of riced cauliflower. It was delicious and hit the spot on a cold and dreary Michigan winter evening.! Protip: do not confuse watercress with upland cress. They may look the same, but upland cress is way more bitter, much like the way I felt after accidentally making this soup with upland cress. First thought: Oh, immersion blender. Sounds like another expensive kitchen gadget, sigh. Googled it, found out I already have one, LOL – it's a hand (stick) blender! Doh. I made this with baby spinach and it was DELICIOUS!!!! I just made this using baby kale and I loved it! I was honestly expecting it to be a bit bland but it really was tasty. I added shredded parm as a garnish. I wasn't quite sure how to get my 3 year old son to eat soup, so I served it over pasta shapes for him (sort of like a pesto sauce) and it was genius! My husband and I LOVE this soup. I tried a "variation"…I substituted Cilantro for the watercress and added two large seeded Serano Chilies (sauted w/ the onion). Delish! Next, I want to try substituting roasted red bell peppers for a "smokey" flavor. I love watercress! My favorite way to eat it is in turkey sandwiches with herbal mayo, tomatoes, and cheese (preferably on pumpernickel bread) or next to Trinidadian styled curries and stews. So excited to try this recipe. Just wondering if my family are not big cauliflower fans, do you think they would still enjoy this soup? It looks amazing, but is the cauliflower overwhelming? Can I substitute coconut flour for the white flour? Does anyone know the WW points plus on this? I bet it was healthy and delicious soup so I guess its perfect for my diet huh! 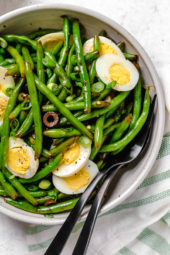 Oh how I would love to have this for dinner on a cold winter night, but I can just imagine the look on my kids' faces when they see its color. I will have to make it and wait until the power goes out. 🙂 Seriously, I am clueless to the real differences between spinach, kale, arugula, watercress, etc. Is there a "taste" reason to pick one over another, or do some work better in soups or casseroles. Baby spinach or kale would be wonderful too! Thanks for the suggestions! I regularly make your Dad's cauliflower soup, so I'll definitely be trying this out this week. If I can't find watercress (I don't even know what it looks like), I'll try some spinach or kale! I used a block of frozen chopped spinach instead of watercress. Spinach substitution worked great, tasted great and was easy to find (in my freezer). I also used a small bake potato for thicken instead of flour and added some cayenne pepper for a kick. I will make it again. Very happy with this easy recipe. Snow has me stuck in the house so I used arugula instead of watercress… It was amazing! Thank you! What a yummy looking soup, love the creativity! what is the purpose of the flour? Can it be omitted or substituted? I can answer that. The flour combined with the fat (in this case, butter), typically in a one to one ratio, is a roux. You cook it for a bit so you won't be tasting raw flour and then you add the liquid. It thickens the soup as it cooks. Yummy! Its a must try! For your dad's soup, you made the roux first and then just added the onions with the cauliflower. Is one way better than the other? Do you think spinach would work in place of the watercress? I have never eaten watercress so I guess this is one way to try it. I appreciate the recipes and Points+ you provide. Pinning this to try. What a beautiful soup. I need to try this. I got an immersion blender for Christmas and it's amazing. 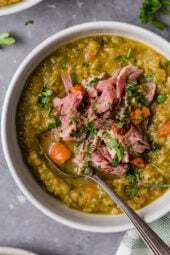 I made split pea soup last week and it was so much fun to blend it all up…haha. Simple pleasures! Can't wait to try this delicious looking soup. 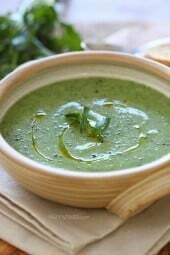 I have never tasted Cauliflower Watercress Soup and I want to try! I go with green and I love eating clean and healthy dishes. 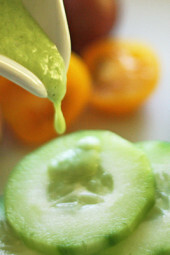 what do you do if you don't have an immersion blender….can you use a food processor or blender? Use a blender in small batches. I love the Cauliflower soup and this looks like a wonderful addition, I'm thinking spinach would be good, too. Looks so good. Does this freeze easily? We are a household of two and I always look for soups/stews that will freeze.